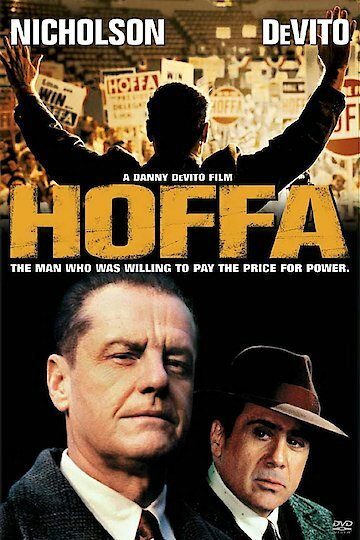 Hoffa was a 1992 biopic that is directed by Danny DeVito and stars Jack Nicholson, Danny DeVito, Armand Assante, J. T. Walsh and John C. Reilly. The film is centered around the events that took place with Jimmy Hoffa and the Teamsters Union group he led. The film starts with Jimmy Hoffa (Jack Nicholson) and his friend Bobby Ciaro (Donny DeVito) meet at a Diner. They begin to have conversation about Hoffa's past, which sets the basis for this movie's plot told in flashbacks. It is a moving movie depicting one of the most infamous leaders of a union. Actors such as John C. Reilly gain their status by working on this movie. This movie ends with its own vision of Jimmy Hoffa's disappearance, constructing the life of Hoffa up to his demise. Hoffa is currently available to watch and stream, download, buy on demand at Amazon Prime, HBO NOW, Amazon, Vudu, Google Play, FandangoNow, iTunes, YouTube VOD online.